Denison is about community—the diverse collection of people who benefit from and care for this special college. That “community” attitude and atmosphere is at the root of how the Denison operates. The college is governed by several representative groups. The Board of Trustees is responsible for the legal ownership and preservation of the college and has a final say in all governance matters. The faculty stewards the academic program; and the administration manages day-to-day operations. The other critical component is the Denison Campus Governance Association (DCGA), a body of 40 students elected by their peers to represent the student voice in the life of the college. 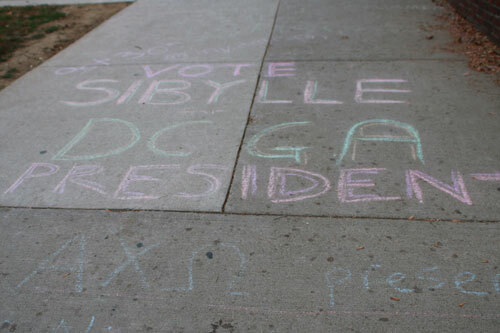 DCGA legislates issues that pertain directly to campus culture. In recent years, it has designed and implemented Denison’s Code of Academic Integrity, which upholds a culture of intellectual honesty, and the Party Registration System, which advocates a safe and respectful social environment. DCGA works with the administration to identify campus improvement projects and appoints students to work alongside faculty on committees that govern academic and operational concerns. Its members also meticulously allocate an annual budget of roughly $900,000 among more than 170 student organizations. In return, DCGA members gain real-world understanding of democratic processes and satisfaction that the hard work they perform today cultivates the Denison of tomorrow.